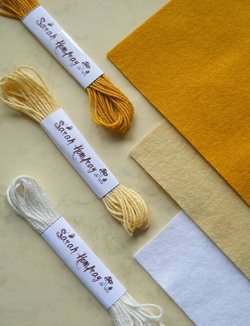 Use these matched felt and soft string sets for the goldwork padding techniques. The 'soft string' is 100% cotton and comes in an 4 metre skein. The 15cm square felt is 30/70 wool/synthetic blend, retaining the soft, durable, flexible features of a traditional wool felt with the strength of a modern material mix. Available in Dark Gold for gold metals on darker fabrics, Pale Gold for gold metals on lighter fabrics and White for silver metal threads. Item is for one set only. You will need beeswax for this technique, have you got yours?